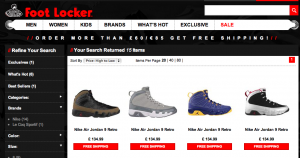 Most of the Air Jordan Kilroy 9 pack are still available at footlocker. There is one catch tho, they ship from England. Normally here at Cop These Kicks we bring news of restocks. In this case Footlocker’s european site has the Retro 9 still in stock for £135 (which is about $200 after conversion) and ships to the US. They also have the Foamposite Fighter Jet for a just barely over retail $240 a far cry from the $350 they pull in on eBay. Also worth noting is they have the LeBron Black History Month (BHM) in almost a full run, the LeBron X Area 72 (All-Star) and Barkley Posite Max “Eggplant”.